Upgrading to or getting a permanent card is easy. 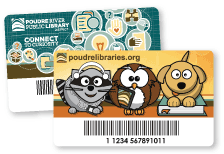 Just visit any of the 3 libraries, (Old Town, Harmony, or Council Tree), in the Poudre River Public Library District and bring a current/valid photo ID and proof of a Colorado address. Don't have a Colorado address? Just ask our staff! Children under the age of 12, with no current school ID, must have a parent or legal guardian present to sign their card. Parents/Guardians are financially responsible for their child's account and for the selection and use of resources by their minor children. Teens 17 and under can get a library card without their parent or guardian being present. They can present their current student ID, Colorado photo ID, or a Colorado driver's license or permit at any of our three locations to become a cardholder. CSU students, faculty and staff can opt-in to use their RamCards as public library cards. The Library District's Teacher Library Card was created to support teachers' unique professional needs. Teachers of young children through high school students may qualify for this special card, valid for a year. View the Teacher Card brochure for features and benefits. Treat your card as you would a credit card; report a lost or stolen card immediately. Temporary and out-of-state residents may obtain a library card. Ask at the Checkout Desk for information. We honor cards from other Colorado public libraries as part of the Colorado Library Card (CLC) project. 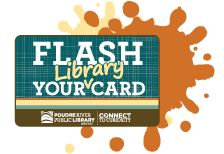 A card from the Poudre River Public Library District will be issued with a valid ID to these card holders.